The next Stamp Camp event takes place Nov. 24 at 1:30 p.m. at Suzy McBride's home, located at 2424 Gerda St., SLO. There's a $10 materials fee. Visit drsuzy.stampinup.net to register and for info on other upcoming workshops. There are only two kinds of people in this world: those who start listening to Christmas music after Halloween and those who wait until Thanksgiving is over. I'm a card-carrying member of the former, and I'm pretty sure most of the participants of Suzy McBride's Stampin' Up workshops are, too. Well, at least at the one I attended, which focused on holiday card crafting. Having little to no DIY experience, I didn't really know what I was getting myself into that Saturday afternoon at the Arroyo Grande Library. Yet somehow, I walked away with two homemade holiday cards that I'm quite proud of. Part of me wants to just keep them for myself rather than send them out. Afterall, sending holiday wishes is what Facebook's for, right? "There is a particular joy in receiving an actual card in the mail," McBride said. "Even more joy when you realize the sender took the time to actually make the card for you." CARDCORE Instructor Suzy McBride (left) and workshop participant Snook Powers (right) show off their creations. 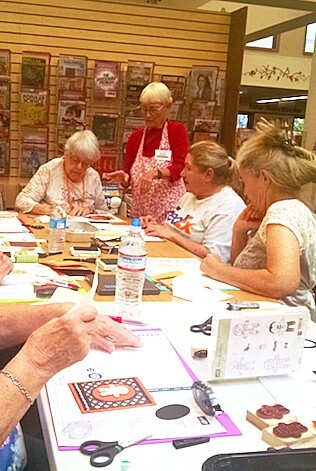 A retired Cal Poly professor, McBride has been a Stampin' Up, or "Stamp Camp," demonstrator for 13 years. "I simply love doing this," McBride said. "I love color and design but really don't have the necessary drawing skills to create the images I desire." That's where the stamping comes in, McBride continued. CLASS IN SESSION Stampin' Up demonstrator Suzy McBride hosts Stamp Camp workshops throughout the year at libraries, fundraising events, and her own home. "Rubber stamping creates those images," she said. "The beautiful multitude of colors and patterns available help with the design [of the holiday cards]." 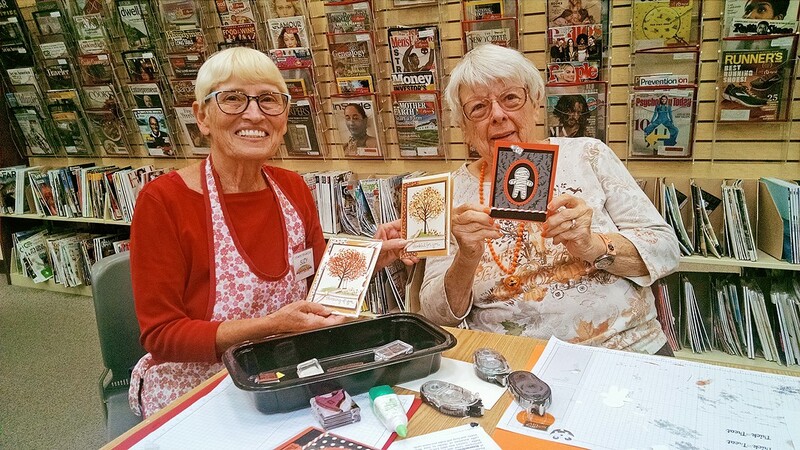 McBride's stamping and paper crafting demos are periodically offered at various SLO County locations, including the SLO Library and even her own home on occasion. Aside from materials fees, the workshops are usually completely free of charge. But whenever there's an opportunity to use one of her classes as a fundraising event, McBride leaps at the chance. Her most recent Stamp Camp fundraiser helped raise $1,400 for an aspiring teacher hoping to study in Tanzania toward a master's degree. A $15 to $20 donation was requested from each card-making participant. McBride even offered an alternative option to those who couldn't make it to the workshop but still wanted to donate: She made their holiday cards herself. Had I been offered that same option before my class started, I might have taken it. When I first sat down to start crafting, I stared in confusion at some of the unfamiliar instruments that lay before me. One resembled a giant hole puncher, except it punched out little characters you could use to decorate your cards with. EXPECTATIONS VS. 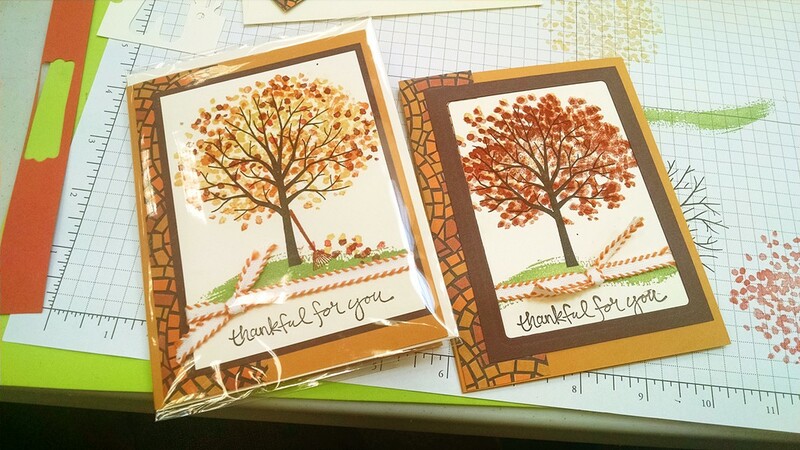 REALITY My Thanksgiving card (right) came out almost identical to the example card (left) we were given, minus a rake and some leaves. I just wanted my cards to magically make themselves at first, but that feeling went away once I got that puncher down (still don't know what that thing is called). I was punching characters left and right. 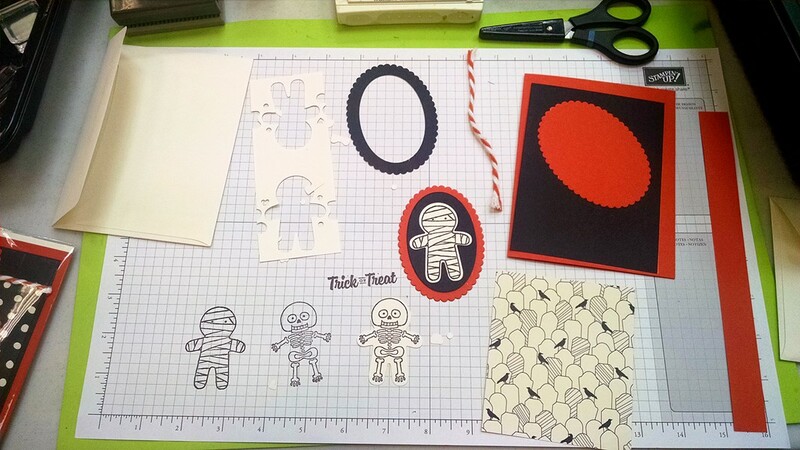 The only one I ended up actually using though was a mummy for a Halloween card (saving that for next year, obviously). McBride was available for questions during the entire class of course, so any questions that came to mind were answered. She wandered around the group table conversing with each participant. Some were regulars. Some were even past students from her teaching days at Cal Poly, she said. And the rest, like me, were brand new. MUMMY DEAREST After finishing my Thanksgiving card, I had time to start working on a Halloween card for next year. Calendar Editor Caleb Wiseblood collects cards of the Dragon Ball Z variety. Reach him at cwiseblood@newtimesslo.com.